Happy Bloggers Challenge Friday! Thanks to those who played along with the Halloween Challenge, the challenge this week is Stencils. I still had the Dottie Stencil from Just a Trace on my desk, so I reached for that when working on my project this week, and went a little of of my comfort zone to play along with the Color Challenge at Stampotique, as I rarely use Purple in my projects. I created the monoprint background using the Gelli Arts Plate, DecoArt Paint (Mixed Media Ultramarine Blue/American Multi Surface Satin Light Violet/Flamingo/Cottonball) and the Dottie Stencil. I stamped the image on card stock and on scraps of the monoprinted background so that I could paper piece the image. I added a piece of old book note for added interest, stamped some flowers and added the sentiment that I had stamped on scraps of the background panel. All pieces were adhered with DecoArt Gel Medium, I used a STAEDTLER Fineliner to draw around the edge of the sentiment. Fabulous! Love the vibrant purples and the paper pieced image. How lovely to see you on the Stampotique FB Page ! Great creation ! Love it! Thanks for joining us at Stampotique Designer's Challenge this week. She's such a lonley girl! Check out that great bg, love the finsl outcome. 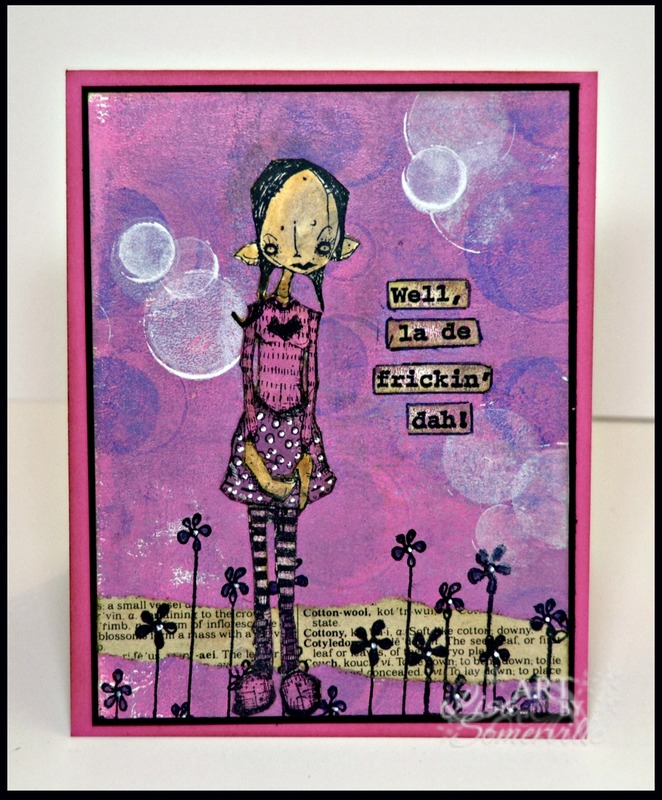 Love the background, Lisa, and it's perfect for showcasing that Stampotique image! Awesome paper piecing skills, I might add! Thanks for joining us at the Stampotique Designers' Challenge this week!